An object in California is criticized by some and heralded by others. On one hand it promotes liberty yet on the other it can cause tragedy and bloodshed. Used properly it can be a great safety net to the people of California while improper or criminal use will result in bloodshed. Some find them disturbing while others appreciate the benefit they provide. Of course I am speaking of Wind Turbines. Thought I was talking about guns? Gimme a minute. The murder machines that are wind turbines, while providing alternative energy and helping liberate us from foreign oil are still responsible for the declination of the Golden Eagle. Now, if the U.S. Fish and Wildlife Service follows precedent on how California handles things when it comes to the 2nd Amendment, they will no doubt sensationalize the deaths and over look the positives. They will start a smear campaign against anyone who supports wind turbines and cheap power as hating children. Anti-winders will say outlandish things like hoping the pro-wind people’s pets are chopped up and killed. Yet, oddly enough, hypocrisy trumps precedent and instead of denouncing the wind turbines for the feather hating murderers that they are the US Fish and Wildlife Service are looking to ALLOW giving Wind Turbine owners an acceptable amount of “mistakes” and “tragedies”. 5 per year to be exact and 25 over a five year period. Yet when the ban on firearms in National Parks was lifted the US Fish and Wildlife Service investigated for three months trying to derail it by saying that lead ammo was bad for the animals. So, these turbines can kill indiscriminately any bird they want and up to 5 Golden Eagles because “accidents happen” yet my Constitutional Right does not extend into California because the actions of some lunatic somehow cause to limit my rights? The point is, as elaborate as I made this article, that wind turbines and firearms are the same thing…tools. Tools can be used properly or improperly. Yet while California is banning lead ammo under the false flag of protecting animals like the Golden Eagle the deafening silence to ban Eagle Pureeing Wind Turbines is overwhelming. Well, that’s about as hypocritical as it gets. 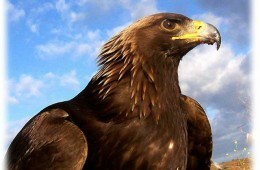 And yes, while I don’t disagree with hunting, I think the decimation of the Golden Eagle is a tragedy.